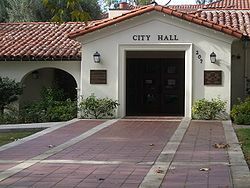 Claremont is a college town on the eastern border of Los Angeles County, California, United States, 32.5 miles (52.3 km) east of downtown Los Angeles, at the base of the San Gabriel Mountains. The population, as of the 2010 census, is 34,926. Claremont is known for its many educational institutions, its tree-lined streets, and its historic buildings. In July 2007, it was rated by CNN/Money magazine as the fifth best place to live in the United States, and was the highest rated place in California on the list. Due to its large number of trees and residents with doctoral degrees, it is sometimes referred to as "The City of Trees and PhD's". The city is primarily residential, with a significant portion of its commercial activity revolving around "The Village", a popular collection of street-front small stores, boutiques, art galleries, offices, and restaurants adjacent to and west of the Claremont Colleges. The Village was expanded in 2007, adding a controversial  multi-use development that includes a cinema, a boutique hotel, retail space, offices, and a parking structure on the site of an old citrus packing plant just west of Indian Hill Boulevard. Some critics say that the expansion negatively altered the original, small-town feel of The Village. The citrus groves and open space which once dominated the northern portion of the city have been replaced by residential developments of large homes. Construction of Stone Canyon Preserve, one of the final residential tract developments in the north of the city, commenced in 2003 as part of a complicated agreement between Pomona College and the City of Claremont which resulted in the creation of the 1,740-acre (7.0 km2) Wilderness Park. The northern, foothill area also includes the Padua Hills Theatre, a historic site constructed in 1930. Claremont has been a winner of the National Arbor Day Association's Tree City USA award for 22 consecutive years. When the city incorporated in 1907, local citizens started what has since become the city's tree-planting tradition. Claremont is one of the few remaining places in North America with American Elm trees that have not been exposed to Dutch elm disease. The stately trees line Indian Hill Boulevard in the vicinity of the city's Memorial Park. Commuter train service to Claremont is provided by Metrolink from the Claremont Metrolink Station. The station is on the San Bernardino Line, with trains traveling to Los Angeles and San Bernardino several times each day.